This is the best eyebrow pencil due to its triangular brow pencil shape. Perfect for shaping and brushing, it does not need sharpening and does not break easily like conventional pencils. Please chose the colour that suits you best. The triangular shape of Empro’s pencil tip makes it easy to draw a thick line for the first half of the eyebrow, while the thinner tip creates the thin line of the outer half of the brow. 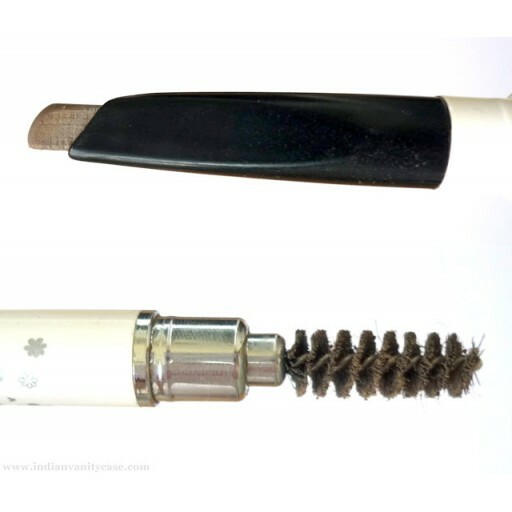 This Triangular Eyebrow Pencil also has a brow brush that may be used to even the colour on the brow. This long lasting, revolutionary eyebrow pencil does not need sharpening and does not break easily like conventional eyebrow pencils. This translates into less wastage and big savings. The innovative triangular tip ensures that users get perfect brows in 2 easy steps. The unique design of the triangular tip is very easy to control when drawing from front to tail in order to give you a natural-looking eyebrow. Even those who lack experience in drawing eyebrows will find that its easy application yields perfect results every time. Each shade could draw up to 3 tones and it is suitable for all women, young and mature. 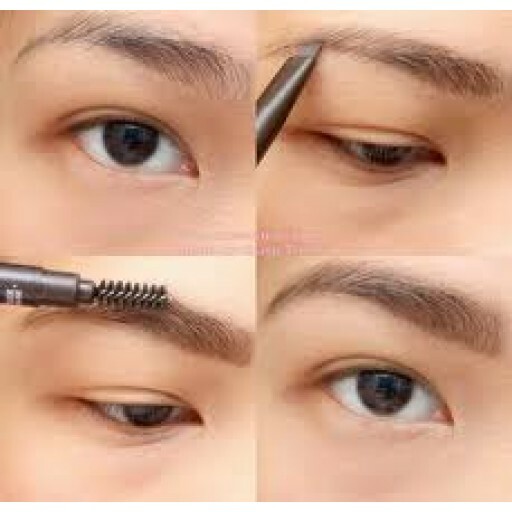 Start with the inner corner of your brow, use thick lead to lightly stroke upward towards the highest part of the arch. Use the thin lead to stroke from the arch to outer corner of your brow. In 2 easy steps, 5 attractive shades available for all styles. Hi There, Do you sell the REFILL for Empro Brow Pencil ? Thank you. Like others, I first purchased this product on a Malaysian Airlines flight. I loved the eyebrow pencil and went looking to try and purchase more, but was unsuccessful, so I was very pleased when I found that I could obtain the Empro eyebrow pencil via the Skinsentials site. I love the triangle shape, it helps to create a natural looking eyebrow. The pencil slides easily across the skin and is very natural looking and I find that it lasts all day. I have found that one pencil has lasted almost 12 months, using it every day. I know that refills are available and am hoping that maybe Skinsentials might start to stock them as well. Can only confirm the review by tanja .. Found on Malaysian Airlines and so happy to hear Skinsentials are selling. This is the perfect pencil for someone who is not too clever at pencilling in their own brows, the angled shape helps so much and it glides on so easily .. Just need them to make a waterproof one now. Best ever, look no further! I've tried so many eyebrow pencils that when I came across the Empro Triangular Brow Pencil during a Malaysian Airlines flight, I thought may as well try this one as it was reviewed as winning an award. 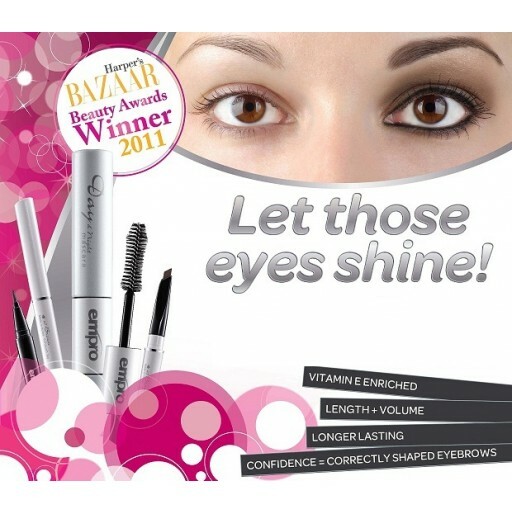 It's true, it is the BEST eyebrow pencil! It gives the best shape every time you use it and lasts all day long. It's like an instant brow lift. I love it! I'm so glad to have come across skinsentials.com.au that I'm stocking up. The Empro Triangular Brow Liner is amazing i have not come across such an amazing product i wish it was around 30yrs ago... my 2 daughters love it aswell. We could only purchase this product on Malaysian Airlines so when anyone flew we would get friends to buy for us. But thanks to Skinsentials for having this product as one of there beauty lines.. thankyou to the team a and management at Skinsentials ! !